What we know about how primates chew and the relationship between form and function of their masticatory apparatus comes from three seemingly disparate research agendas. The earliest and hence most enduring efforts have been made by scientists, dentists, and physicians focused on advancing applied dentistry and related medical fields (e.g., Ahlgren, 1966; Bennett, 1908; Carlsoo, 1952; DuBrul, 1988; Gibbs et al., 1971; Lindblom, 1960; Linden, 1998; Moller, 1966). A second group of researchers have studied the masticatory apparatus of humans, other primates, and more rarely nonprimates with the goal of understanding the evolution of human teeth and jaws (e.g., Ashton and Zuckermann, 1954; Biegert, 1956, 1963; Daegling and Grine, 1991; Demes and Creel, 1988; DuBrul, 1977; Gregory, 1920; Jolly, 1970; Kinzey, 1974; Rak, 1983; Robinson, 1956; Walker, 1981; Weidenreich, 1943; Wolpoff, 1973; Wood, 1981). Finally, a smaller group of researchers have been working to describe the patterns of variation in masticatory apparatus form and function among nonhuman primates (e.g., Beecher, 1977a,b, 1979; Bouvier, 1986; Daegling, 1989, 1992, 2001; Hylander, 1979a,b, 1988; Hylander et al., 1987, 1998, 2000; Kay, 1975, 1978; Luschei and Goodwin, 1974; McNamara, 1974; Ravosa, 1991, 1996; Ravosa and Hylander, 1994; Ross and Hylander, 2000; Smith, 1983; Teaford, 1994; Vinyard and Ravosa, 1998; Wall, 1999). The goal of many of the researchers in this third group is to understand the evolutionary history of the primate masticatory apparatus and how this history relates to the patterning of functional and morphological variation among primates. We begin this review by briefly describing chewing in mammals. As part of this description, we provide several definitions frequently used by researchers studying chewing. We then consider the evidence linking jaw morphology and mechanical loads, that deform the jaw during chewing. Subsequently, we discuss the relationship between jaw loading and jaw-muscle activity patterns and by inference, the links between jaw-muscle activity and jaw form. Understanding the associations among jaw loading, jaw-muscle activity and jaw form is fundamental to reconstructing the functional morphology of the masticatory apparatus of fossil primates. With this background in hand, we will then consider the masticatory apparatus in the earliest euprimates and the role that living treeshrews arguably play in studying its form and function. Chewing is the mechanical processing of foods in the oral cavity prior to swallowing. In mammals, chewing involves cyclic patterns of jaw movement during which foods are reduced between the opposing upper and lower postcanine dentition (Hiiemae and Crompton, 1985). A single movement circuit of the mandible is referred to as a chewing cycle, which can be divided into a closing stroke, a power stroke, and an opening stroke (Hiiemae, 1978) (Figure 1). A chewing sequence comprises multiple, sequential chewing cycles. A chewing sequence frequently will have multiple swallows interspersed among its chewing cycles. Finally, most mammals typically chew on one side of the jaw at a time. (B) Mechanical reduction of food occurs at this time. Minimum gape also takes place during the power stroke. The opening stroke begins as the teeth move inferiorly and out of contact (C) Gape increases during the opening stroke as the jaw opens prior to the next closing stroke (adapted from Hiiemae, 1976). The opening stroke of the chewing cycle begins as the upper and lower teeth move out of occlusal (tooth-tooth) or tooth-food-tooth contact (Hiiemae, 1978) (Figure 1). The lower jaw moves away from the upper teeth, primarily inferiorly, during the opening stroke. After the jaw reaches maximum opening, the closing stroke begins with the rapid movement of the jaw superiorly and often laterally to align the teeth for the upcoming power stroke. The closing stroke ends at the commencement of occlusal or tooth-food-tooth contact. The power stroke begins at this contact as the jaw continues to move superiorly, medially, and often anteriorly, albeit at a slower rate (Hiiemae, 1978). Simultaneously, the masticatory apparatus experiences significant loads as foods are mechanically reduced during the power stroke (Hylander and Crompton, 1980, 1986). The next opening stroke begins when occlusal or tooth-food-tooth contact is lost. The extent of jaw movement and the magnitude of jaw loads in a chewing cycle are influenced by the structural and mechanical properties of the food, as well as the relative position of the chewing cycle in a chewing sequence (e.g., Agrawal et al., 1998; Chew et al., 1988; Fish and Mendel, 1982; Hiiemae, 1978; Hylander, 1979a; Luschei and Goodwin, 1974; Oron and Crompton, 1985; Thexton et al., 1980). We begin this section by stating our basic assumption that a significant component of the variation in mammalian jaw morphology is functionally related to differences in chewing behavior. This is not to say that all of the morphological variation in the masticatory apparatus is related to functional differences in chewing behaviors, but rather that some measurable component is. This explains our quantifying specific, mechanical aspects of chewing in order to correlate functional variation with morphological variation. Both forces and movements during chewing likely impact masticatory apparatus form, but in this chapter, we concentrate on jaw-muscle forces that occur primarily during the power stroke of mastication. Numerous studies of primates, including in vivo and comparative morphological analyses point to an association between masticatory apparatus form on the one hand and jaw movements and forces during chewing on the other (e.g., Bouvier, 1986; Bouvier and Hylander, 1981; Daegling, 1992; Hylander, 1979a,b, 1984, 1988; Hylander et al., 1987, 1998, 2000; Kay, 1975, 1978; Ravosa, 1991, 1992; Ravosa et al., 2000; Strait, 1993; Taylor, 2002; Teaford and Walker, 1984; Vinyard and Ravosa, 1998; Wall, 1999). Researchers, however, continue to discuss the strength of this relationship within and among primate species (Daegling, 2002; Daegling and McGraw, 2001; Hylander, 1979b; Smith, 1983, 1984; Wood, 1994). Undoubtedly, the morphology of an individual primate's masticatory apparatus reflects the influence of numerous behaviors that have nothing to do with chewing (e.g., anterior-tooth biting, display, or ingestion). Given what we know about the relationship between masticatory apparatus form and function, however, we anticipate that the functional role played by the masticatory apparatus during chewing does affect its form. Furthermore, we expect that these influences may be most easily discerned via interspecific comparisons of higher order groups of primates that differ in specific aspects of their chewing behaviors. In vivo analyses of facial bone strains during mastication. Researchers possess several ways to study the functional morphology of the primate masticatory apparatus. It turns out that one of the most productive approaches for understanding masticatory forces is to attach strain gages directly to the facial bones of living animals and record their deformation or strain during chewing (Daegling and Hylander, 2000; Hylander, 1979a, 1985). This approach provides data showing how jaws are stressed or deformed during chewing.1 For the mandible, these analyses have focused on the mandibular condyle, corpus, and symphysis—three regions of the jaw which experience significant internal forces, or internal loads, during chewing.2 We define the phrase "significant loads" relative to an empirical observation that homotypic locations on load-bearing elements experience relatively similar strain magnitudes, as large as 1000-3000 |ie, during habitual loading across vertebrates of different body sizes and shapes (e.g., Biewener, 1982, 1989, 1990; Lanyon and Rubin, 1985; Rubin and Lanyon, 1984; Rubin et al., 1992, 1994). 1 When an external force is applied to a structure, the structure deforms as it resists this force. This deformation, or internal force, is measured by the stress created within the structure, while the displacement created within the structure is measured by its strain. Stress (a) is defined as force per unit area and is generally expressed in Newtons (N) per meter or Pascals (N/m). Strain (e) is a dimensionless unit measuring the amount of displacement or change in length (AL) divided by the original length (L) of a structure (AL/L). Strain is often expressed in microstrain (|e) or 1X10-6 mm/mm, (see e.g., Beer and Johnston, 1977; Biewener, 1992). 2 Hylander and Johnson (1997) also demonstrated that the anterior portion of the zygomatic arch in macaques experiences significant strains during chewing. However, we are not discussing this region because there has not been a systematic analysis of zygomatic arch morphology among primates. during the power stroke of mastication (Boyd et al., 1990; Brehnan et al., 1981; Hylander, 1979c; Hylander and Bays, 1979). The best way to resist a compressive force at the condyle is to increase the area of the articular surface resisting the load simply because stress is a function of a force per unit area (Bouvier, 1986a,b; Herring, 1985; Hylander, 1979b; Smith et al., 1983; Vinyard, 1999; Wall, 1999). The working-side mandibular corpus in the molar region is sheared dorsoventrally: twisted about its long axis and bent in parasagittal and transverse planes during the power stroke (Hylander, 1979a; Hylander et al., 1987). Twisting of the corpus about its long axis appears to create the largest stresses on the working side of the jaw during mastication (Dechow and Hylander, 2000; Hylander, 1988). Generally, the most effective solution for resisting twisting loads is to increase the mediolateral width of the mandibular corpus (Daegling, 1992; Hylander, 1979a,b, 1988; Ravosa, 1991, 1996; Ravosa and Hylander, 1994). On the balancing side, the mandibular corpus in the molar region is sheared dorsoventrally: twisted about its long axis and bent in a parasagittal plane during chewing (Hylander, 1979a). Parasagittal bending appears to create the largest loads along the balancing-side corpus during chewing (Hylander, 1988). The most effective way of providing greater resistance to parasagittal bending moments is to increase the vertical depth of the corpus (Daegling, 1992; Hylander, 1979a,b, 1988; Ravosa, 1991, 1996; Ravosa and Hylander, 1994). The primate mandibular symphysis during chewing routinely experiences dorsoventral (DV) shearing, bending in a coronal plane and in some species lateral transverse bending, or wishboning (Hylander, 1984, 1985). In species that routinely wishbone their symphyses, this loading regime arguably generates the largest stresses, or internal forces, at the symphysis (Hylander, 1984, 1985, 1988; Hylander et al., 1998). Fusing the left and right halves of the mandible strengthens the symphysis by replacing relatively weaker ligaments with bone thereby providing increased ability to resist loads. Furthermore, increasing sym-physeal area also provides greater resistance to DV shearing. Increasing the vertical (or dorsoventral) length of the symphysis offers an efficient means of providing more resistance to symphyseal bending in a coronal plane, while increasing the anteroposterior width of the symphysis provides an effective way of increasing the ability to resist wishboning (Daegling, 1992; Hylander, 1984, 1985, 1988; Ravosa and Hylander, 1994; Ravosa and Simons, 1994). The morphological bottom line for resisting these loads is that larger and/or denser jaws, sometimes larger in a specific direction and other times larger in magnitude regardless of direction, offer increased resistance ability. One of the best examples linking jaw form and jaw load-resistance ability in primates is the comparison of strepsirrhines with mobile, unfused mandibular symphyses to living anthropoids all with fully ossified symphyses. Hylander (1979a) and Hylander et al. (1998) demonstrate that greater galagos, a strep-sirrhine with an unfused symphysis, shows comparable levels of bone strain on the working side of the mandibular corpus during vigorous chewing as compared to macaques and owl monkeys—two anthropoids with fully fused symphyses (Table 1). Galagos, however, have much lower levels of corporal strain on the balancing side of the jaw during chewing as compared to these two anthropoids (Table 1). Thus, the ratio of working- to balancing-side (W/B) corporal strain is much higher in galagos as compared to macaques and owl monkeys (Table 1). This suggests that galagos, and perhaps all strepsirrhines with loose, mobile symphyses, recruit relatively less muscle force from the balancing side of the jaw during chewing when compared to anthropoids with fused symphyses (Hylander, 1977, 1979a,b; Hylander et al., 1998). ^Data from Hylander et al. (1998). Strain in microstrain (^£). ^The reported W/B strain ratio is not the ratio of average working- and balancing-side shear strains reported here, but rather the average of experimental W/B strain ratios reported in Hylander et al. (1998). 'Data from Hylander et al. (2000). Figure 2. Comparison of load-resistance ability in strepsirrhine and anthropoid jaws. (A) Plot of In corporal depth versus the In chewing moment arm (condyle—Ml distance) in 44 anthropoids and 47 strepsirrhines. Only strepsirrhines with unfused symphyses are included. Anthropoids are visibly transposed above strepsirrhines for their corporal depth at a given condyle—Ml length. This transposition suggests that anthropoids can resist relatively greater amounts of corporal bending for a given moment arm as compared to strepsirrhines. (B) Plot of In symphyseal area versus In chewing moment arm length for anthropoids and strepsirrhines. Anthropoids are similarly transposed above strepsirrhines suggesting they have relatively greater load resistance ability at the symphysis. Figure 2. (Continued) (C) Plot of In condylar area versus In chewing moment arm length in anthropoids and strepsirrhines. 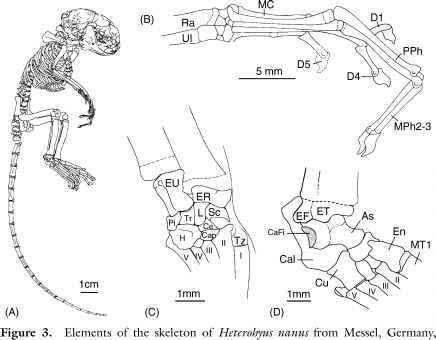 The transposition of anthropoids above strepsirrhines again suggests that they have relatively greater ability to resist loads at the condyle as compared to strepsirrhines. In plots 2a-2c, indriids show considerable overlap with anthropoids. (See Vinyard, 1999 for further information). is not necessarily equally valid. That is, corporal depth in strepsirrhines may not be linked to low balancing-side strains. This is true because, if strepsirrhines have significantly lower balancing-side as compared to working-side strains, then their corporal form should be related to working-side loads during chewing. Balancing-side strains need to be larger and/or have a different loading pattern than working-side strains so as to influence corporal form. 3 A strong argument has been made that symphyseal fusion in anthropoids is related to resisting increased transversely, rather than vertically directed forces during chewing (Ravosa and Hylander, 1994; Hylander et al., 2000). Thus, fusion would be related to resisting wishboning rather than DV shear forces. Similarly, the relatively larger symphyses of anthropoids may reflect further structural buttressing to withstand wishboning forces during mastication (Hylander, 1984, 1985; Hylander et al., 2000; Ravosa and Hylander, 1994). The corporal strain data, however, suggest that strepsirrhines experience less DV shear than anthropoids, regardless of whether anthropoid symphyseal fusion is directly related to this loading regime. In other words, it is possible that if the anthropoid symphysis had never needed to fuse to resist wishboning, then it might have needed to fuse or become larger in area to resist increased DV shearing forces. Finally, greater recruitment of the balancing-side jaw muscles increases reaction forces at the balancing-side condyle. Thus, anthropoids should have relatively larger condylar areas than strepsirrhines because of the increased forces at the balancing-side condyle. (This assumes that anthropoids and strepsirrhines experience relatively similar working-side condylar stresses.) Anthropoids do tend to have relatively larger condylar areas than strepsir-rhines with unfused symphyses for a given chewing moment arm length (Vinyard, 1999) (Figure 2C). These comparisons collectively show that variation in jaw loading between the two suborders correlates with variation in jaw morphology. Arguably, these correlations reflect an underlying link between jaw stresses during chewing and jaw form among primates. Even though in vivo strain gage studies provide unique insights into the stresses along both sides of the jaw during chewing, they do not offer direct information on how animals recruit specific jaw muscles. Because the jaw muscles create masticatory forces and jaw movements during chewing, we need to understand when the various jaw muscles are active and how strongly they are recruited. Biologists routinely use electromyography (EMG) to study jaw-muscle activity patterns during chewing (e.g., Ahlgren, 1966; Moller, 1966; Kallen and Gans, 1972; Luschei and Goodwin, 1974; de Vree and Gans, 1976; Clark et al., 1978; Hiiemae, 1978; Herring et al., 1979; Gorniak and Gans, 1980; Hannam and Wood, 1981; Weijs and Dantuma, 1981; Oron and Crompton, 1985; Hylander et al., 1987, 2000; de Gueldre and de Vree, 1988). Electromyographic approaches allow us to identify when these muscles are most active and in some cases allow us to speculate on the relative amount of muscle force recruited (e.g., Basmajian, 1978; Gans et al., 1978; Loeb and Gans, 1986). The relationship between jaw-muscle EMG and forces during chewing. One of the first questions to ask when trying to link masticatory EMG studies to jaw form is, to what extent are jaw-muscle EMG magnitudes correlated with forces during chewing? Many researchers have demonstrated a positive correlation between the relative magnitudes of jaw-muscle EMG and submaximal isometric bite forces (see references in Hylander and Johnson, 1989). In these static biting situations, the jaw muscles fire under nearly isometric conditions (i.e., with minimal jaw movement). This means that EMG activity largely reflects the production of muscle and reaction forces (bite force and TMJ reaction forces) instead of some combination of masticatory force and jaw movements. Hylander and Johnson (1989) demonstrated that the relative magnitude of masseter EMG is highly correlated with the magnitude of in vivo strains in the zygomatic arch during chewing. This result supports a previous assertion by Weijs (1980) that relative EMG magnitude can be used as a relative estimate of muscle force during chewing. In this situation, we must model maximum force production during the power stroke as a "quasi-static" event. It appears reasonable to do this because jaw muscles shorten slowly at this time. This link between force and jaw-muscle EMG magnitude is important in theory, but in practical terms we find it extremely difficult to identify an individual jaw muscle's contribution to chewing forces. This difficulty arises because multiple jaw muscles act both synchronously and asynchronously during chewing and the magnitude of any one muscle's EMG interference pattern is not directly comparable to that of other muscles (Loeb and Gans, 1986). One solution to this problem is to scale an electrode's EMG magnitude during a chewing cycle to the maximum value observed in that same electrode across all of the other chewing cycles in an experiment and then compare the ratio of scaled values between the working and balancing side of a muscle pair (Dessem and Druzinsky, 1992; Hylander et al., 1992, 2000). This working-balancing (W/B) ratio provides an estimate of the peak activity of the working-side muscle as compared to its balancing-side counterpart. We must remember, however, that the peak activities of these two muscles are not necessarily occurring at the same time. There is some evidence that the W/B ratio correlates with overall force levels during chewing. Hylander et al. (1992) found that as masticatory forces increased, as estimated by zygomatic arch strains, masseter W/B EMG ratios tend to decrease during chewing in macaques. Thus, on average, larger forces correlate with lower W/B EMG ratios (Hylander et al., 1992). This suggests that macaques, and maybe other primates too, often increase force production during chewing by recruiting relatively greater amounts of balancing-side jaw-muscle force and thus lowering their W/B ratio. As a cautionary note, Hylander et al. (1992) point out that this pattern is variable as some animals show no relationship between zygomatic arch strain levels and W/B EMG ratios. Furthermore, there is greater variation in W/B ratio with foods that are easier to chew (i.e., structurally weaker and/or less tough) because an animal can recruit the necessary chewing force with many different muscle combinations (Hylander, 1979a). In conclusion, an association often exists between W/B EMG ratios and jaw-muscle forces, but this relationship is not an invariant one. Suborder comparisons of W/B EMG ratios during chewing. We can return to our initial comparison of galagos to macaques and owl monkeys and ask whether the W/B EMG ratios for the superficial and deep masseters show the same interspecific pattern as seen in the W/B corporal strain ratios (Table 1). Like the W/B corporal strain ratios, galagos have higher average masseter W/B EMG ratios than macaques and owl monkeys. This suggests that compared to these anthropoids, galagos recruit their balancing-side masseters relatively less strongly than they do their working-side masseters (Hylander et al., 2000). The observed similarity between average corporal strain ratios and masseter EMG ratios provides some evidence linking relative EMG magnitude to force levels and by inference to differences in jaw form between the two suborders (see Table 1 and Figure 2). Hylander et al. (2000, 2002) tested two hypotheses linking balancing-side masseter force and the presence or absence of symphyseal fusion in greater galagos, ring-tailed lemurs, macaques, baboons and owl monkeys. Greater galagos, with unfused symphyses, have higher average W/B ratios than the three anthropoid species for the superficial masseters, while ring-tailed lemurs are roughly comparable. However, the average superficial masseter W/B ratios for individual experiments in greater galagos overlap with anthropoid average W/B ratios across experiments. On the other hand, the deep masseter W/B ratios are significantly higher in greater galagos and ring-tailed lemurs as compared to anthropoids. Given the large transverse direction of pull in the deep masseter, these results support the hypothesis that fusion of the anthropoid symphysis relates primarily to transversely-directed forces from the deep masseter (Hylander et al., 2000, 2002). We cannot completely rule out the hypothesis linking vertically-directed forces and symphyseal fusion based solely on masseter EMG if the balancing-side temporalis is the primary muscle generating DV shear at the symphysis (Hylander et al., n.d.). The linking of balancing-side temporalis activity to DV shear follows from the observations that (1) the balancing-side muscles may be creating most of the balancing-side corporal strain (Hylander, 1977), (2) peak balancing-side strains in the mandibular corpus occur after working-side corporal strains (Hylander et al., 1987), and (3) the balancing-side temporalis muscle peaks late in the chewing sequence (Hylander and Johnson, 1994; Weijs, 1994). These observations suggest that a comparison of temporalis W/B ratios also may be important for evaluating the link between vertically-directed forces and symphyseal form (Hylander et al., 2005). The timing of peak EMG activity during the chewing cycle. Electromygraphic data also provide information about the timing of jaw-muscle force production during a chewing cycle. As might be expected, EMG studies have shown that all mammals do not fire their jaw muscles in the same sequence during chewing (Weijs, 1994). That having been said, several researchers suggest that there may be a common, primitive firing pattern found in many mammals including several primates (Gorniak, 1985; Hiiemae, 1978; Langenbach and van Eijden, 2001; Weijs, 1994). Most of the jaw-closing muscles are thought to fire in three, somewhat distinct, groups in this generalized model. These groups are: (1) a vertically oriented group of symmetric closers (VSC), (2) Triplet I, and (3) Triplet II. The VSC group includes the anterior and deep portions of the temporalis and the zygomaticomandibularis muscles on both the working and balancing sides. Triplet I muscles include the working-side posterior temporalis, balancing-side medial pterygoid and balancing-side superficial masseter. Triplet II muscles include the balancing-side posterior temporalis, working-side medial pterygoid and working-side superficial masseter. The VSC muscles are said to fire first in a chewing cycle and are thought to peak during the closing stroke. Triplet I muscles peak next near the start of the power stroke and Triplet II muscles peak after Triplet I muscles later during the power stroke (see Hylander et al., 2005 and Vinyard et al., 2005 for tests of this model in primates). Hylander et al. (2000, 2002) also compared the timing of peak EMG activity of the masseters during chewing in greater galagos, ring-tailed lemurs and anthropoids. While the working-side superficial masseter acts as part of Triplet II, the deep masseters vary in their peak activity among species and are not consistently linked to either Triplet. In fact, previous work demonstrates that wishboning in the macaque mandibular symphysis largely relates to the activity of the deep masseter on the balancing side of the jaw (Hylander and Johnson, 1994; Hylander et al., 1987). Peak activity of the balancing-side deep masseter occurs late in the power stroke when most of the other jaw muscles, particularly the ones that could counter the laterally-directed pull of the deep masseter, have already peaked and are rapidly relaxing. To date, all other nonhominoid anthropoids show this firing pattern for the balancing-side deep masseter (Hylander et al., 2000; Vinyard et al., 2001). Greater galagos and ring-tailed lemurs, both with unfused symphyses, do not routinely exhibit this late-peak activity of the balancing-side deep masseter (Hylander et al., 2000, 2002). Because of its late peak activity, large transverse component of pull and significant relative recruitment in anthropoids when compared to the working-side muscle, the balancing-side deep masseter is considered to be a significant cause of wishboning of the anthropoid symphysis. These observations led Hylander et al. (2000, 2002) to hypothesize that symphyseal fusion in anthropoids relates to this wishboning-loading regime. In summary, we can draw some clear links between primate jaw form, internal jaw forces and jaw-muscle activity patterns during chewing. Such links may prove particularly useful in comparisons of higher-level primate clades where it is possible to identify distinct morphological and functional differences among groups. Admittedly, we cannot presently derive irrefutable causal connections between masticatory apparatus form and chewing functions. We do, however, think that it is possible to speculate on the nature of these relationships based on what we know about the biomechanics of chewing in primates.